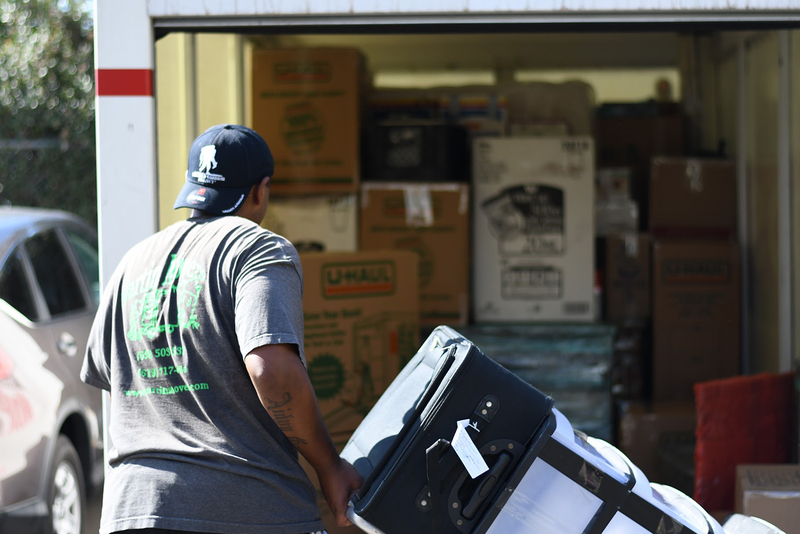 If you’re planning a move and have done the slightest bit of research, you might be wondering, “What’s a moving container?” Most of us can understand rental trucks, which we often see passing by us on the highway. Well if you’re still confused, think of moving containers as the younger, hipper cousins to rental trucks. Basically, moving containers are portable storage units. They are metal or wood containers in which you can store your stuff. Because they are portable, they can be loaded onto a truck for transport down the block (or across the country!). Moving containers make it ultra-convenient for people to load, pack and transport their stuff. They can be delivered to your home or office, where it remains on the grounds while someone loads it up with your stuff. 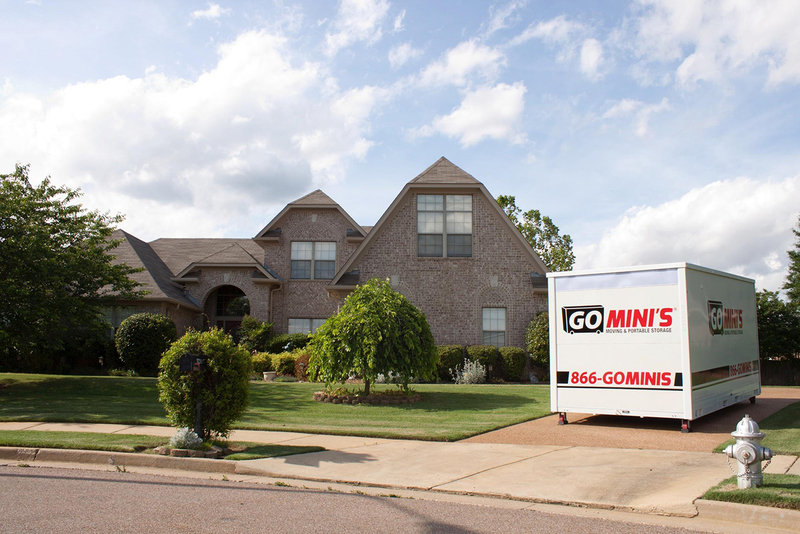 When you’re ready to move, you can call the company to have a professional driver pick it up and deliver it to the next location. There, you unload the goods and move in! You might have seen them on the grounds of your neighbor’s home or local businesses. Once you know what they are, you’ll start spotting them everywhere. It varies, but by and large, moving containers just look like big boxes. Container sizes vary. Some are as big as 16 feet long, while others are as small as 7 feet long. Their heights differ, too. Some are skinny and taller to take advantage of the height to pack in more stuff. Others are shorter, which is really convenient for loading but, of course, might not allow you to fit as many things. Where Do I Go to Get a Moving Container? PODS claims to be the founder of this niche in the industry, and it is arguably the best known of the container companies. But there are other big names, including 1-800-PACK-RAT, Smartbox, and Go Mini’s, to name a few. Even U-Haul has gotten in on the act with U-Box. What Are the Differences Between Companies? 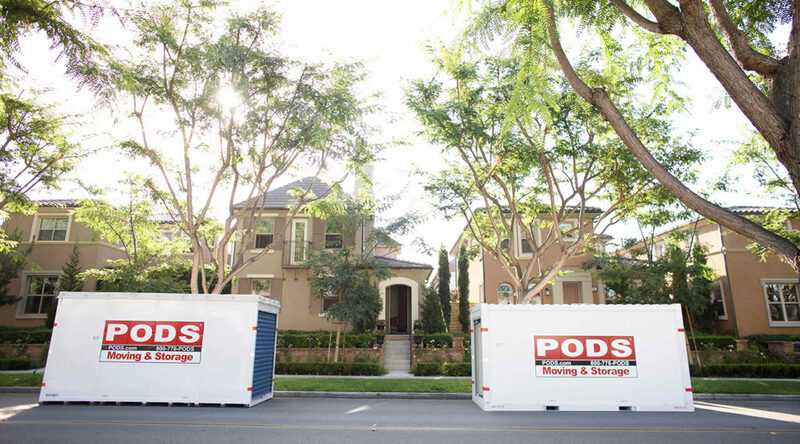 PODS offer customers the chance to rent up to three different sized containers based on their needs. Others, such as Smartbox, rent out just one size container. (In their case, it’s 8 feet wide and 7 feet tall.) Containers are also made of different materials, depending on which company you choose. PODS are steel-framed. U-Pack’s containers are made of “weatherproof metal.” Some others are made of wood and usually include some weatherproof type of covering instead. People frequently debate the merits of each type of container. Some say the metal containers – the likes of which can be found at PODS and 1-800-PACK-RAT – are best because of their sturdy construction and ability to stand up to any kind of weather. Others argue they lack air circulation, which can potentially cause mold, mildew, or at the very least, musty smells. The wooden containers, such as the pressure treated plywood ones that U-Haul/U-Box rents, might allow for more ventilation, but they are not necessarily as weather resistant. 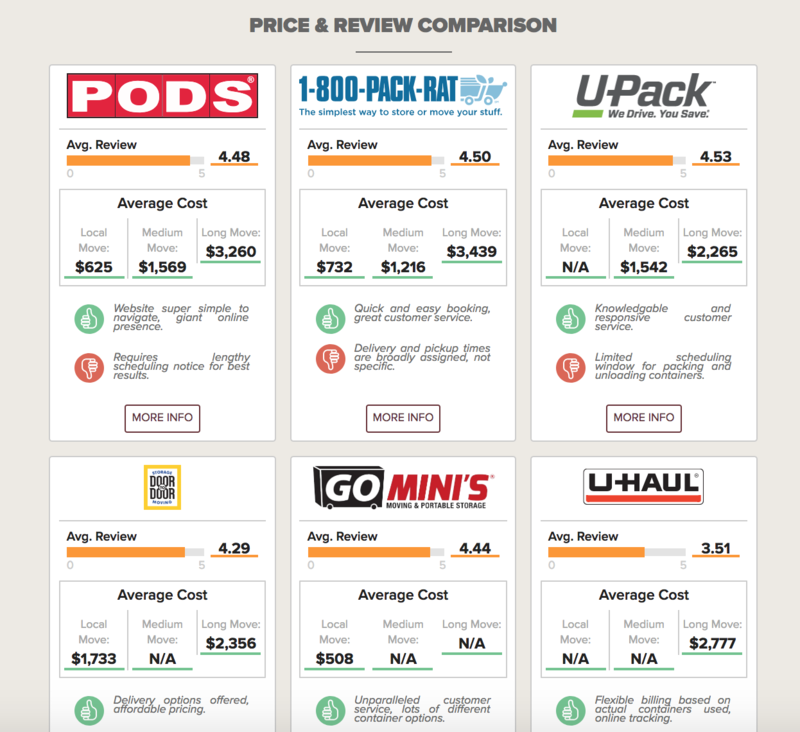 If you really want to dig into all the pros and cons of each company, including average prices, reviews, pictures and more, check out the moving container page at Moving101. How Much Do Moving Containers Cost? Moving containers can be pretty affordable relative to other moving services. They are especially good for those moving to and from smaller homes and apartments. Prices can range between around $500 (to move stuff to and from a small home or apartment in a local move) to $5,000 (for multiple containers making a long-distance move with many items from a large home). The cost really depends on the amount of stuff you plan on transporting and the distance the driver will be traveling. How Big Is My Place I’m Moving Out From? When you have a bigger home, you generally need to rent more containers, which of course elevates the price. In addition, you have to be able to park these containers somewhere without violating local ordinances; with multiple large containers, you might have trouble—especially in a city where parking can be challenging. Sometimes, more containers also require more drivers or trucks. This all matters when gathering estimates. Where Am I Moving To and From? As you might imagine, the cost also depends on which company you choose, based on which container is better for your stuff and if they’re available in your area. Generally, moving containers remain economical for many of those planning a move and looking for a little more convenience and storage. It will cost more than a full-fledged DIY Move that includes renting a moving truck, but it won’t break the bank in the way a Full-Service Move would cost. When Would I Use a Moving Container? Moving containers are a good fit for people who want to conveniently load and unload their stuff in a specific location, on their own schedules. (There’s also no question it’s a better fit for those going a shorter distance and moving less stuff.) But there are plenty of times a portable storage is your best option. Let’s say you can’t get the key to your place until the 25th of the month, but your lease ends on the 14th. What do you do? You call a moving container company. How Does Booking a Moving Container Work? Then typically, you go online or get on the phone, pick out a container, then schedule a date to drop it off wherever your stuff is. A sales representative will help you schedule based on how long you plan to keep the container for loading. You might ask about keeping it longer for storage purposes, in which case you can keep it on the grounds of the old place, or have it transported to the new place if you can get permission from owners or those moving out. Or you could even keep the container in one of the company’s storage facilities if they offer one. You might need the container a few days to load it up. This is one of the differentiating factors between moving containers and trucks (and sales reps love to point this out). After all, rental trucks usually lock you into a schedule with little to no wiggle room. But there’s a catch with that flexible schedule. Sure, you can keep the container for long periods of time. However, if you keep containers longer than one month, you will pay much more than the original estimate because moving container companies generally charge by the month. That means you have one month to load your stuff, schedule a pickup and delivery at the next destination, unload, and finally plan for the final container pick up. About that pickup: usually, the container company sends out a driver to load up your container onto a big truck and drive it to where it needs to go. Another reason people might find containers appealing is the fact they don’t have to drive a van or big rig themselves. You leave the driving to professionals. Anyone hesitant to maneuver one of those big trucks on a highway or a long distance could see this as a major selling point. Can My Movers Help Me with Moving Containers Too? Yes! 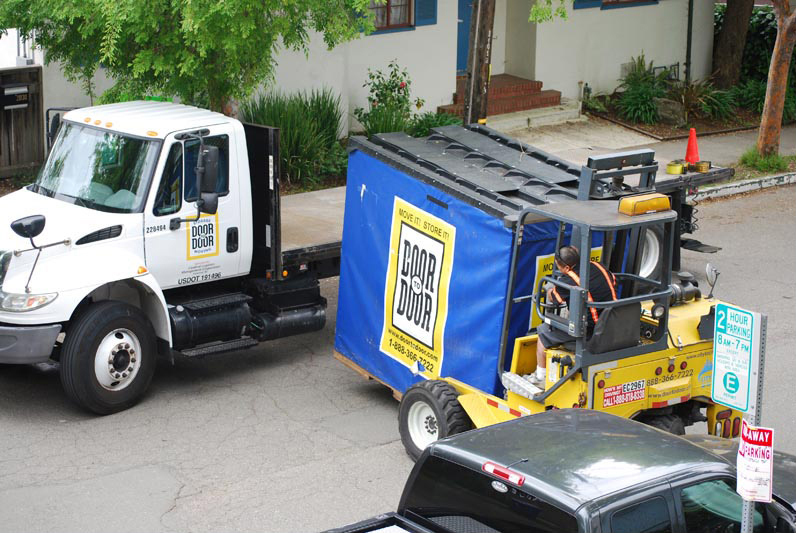 Professionals can load and unload containers just as they would a rental truck. You just have to ask! Moving containers can be a smart choice for people who are looking to make a Full-Service Move at a fraction of the cost, or especially to pull off a Hybrid Move. It’s also a great option for those who need storage. Getting professional help moving can make the move actually not stressful. If you want to save your back and your relationships (by not having to ask family and friends for help), then they’re worth consideration. The first step is learning about the different companies and types of containers they have. Check out Moving101 for all the info you’d ever possibly need. Since every moving container company’s reviews and prices are gathered there in one spot, you can easily find your best option for you, based on your budget, availability and type of container. The second step is to call up the sales representatives to get the low down on their availability, find the best fit for you, and book it! The last step is to decide if you’re going to hire professionals to help you complete tasks like loading and unloading the container. Remember, don’t feel boxed in. You have the power to choose how long they work for and what items they move for you. See prices for movers by the hour – instantly. Easily book your help online. When do you need help? Where do you need help? With a little planning, moving containers fit nicely into any Full-Service Moving hack or Hybrid Move. You can keep your stuff somewhere while you’re moving, or have someone drive your stuff to wherever you need it. If you’re moving, you’d be a little silly to not compare prices and see if a container could save you a lot of money, or if using one would just be way more convenient.